You are currently browsing the category archive for the ‘Atlantic Yards’ category. As expected, the MTA Board voted 10-2 yesterday to allow Atlantic Yards developer Forest City Ratner to make payments for the Vanderbilt Railyards over 22 years, and to build a smaller railyard worth $100 million less than originally promised. Read all about it at Atlantic Yards Report. Via our friends at Develop, Don’t Destroy Brooklyn, the following is a letter from Senator Bill Perkins to the Acting Executive Director and Chief Executive Officer of the MTA. It’s long, but definitely worth a read. The MTA’s Board meets June 22 and is expected to vote on an renegotiated agreement with developer Bruce Ratner for the rights to the Vanderbilt Railyards. I write to follow up on the hearing that was held on May 29th regarding the Atlantic Yards project. At the hearing you testified that MTA was engaged in renegotiations with Forest City Ratner regarding the development rights over the Vanderbilt Yards. The original deal required FCR to make various infrastructure improvements and remit 100 million dollars at closing. You reported at the hearing that the developer now wants to significantly scale down its commitments both in terms of infrastructure and money. It has been reported that the new terms of the deal will be voted on at the MTA’s next board meeting, scheduled for June 24th. I write to request that the MTA immediately fax me a copy of any proposed amended agreements between MTA and FCR. There is already a great deal of public concern about the terms of the various deals at Atlantic Yards, in particular MTA’s acceptance of a substantially below-appraisal offer. Given MTA’s deep financial problems, its reliance on public bailout, and the many concerns raised about the viability of the Atlantic Yards project, MTA must make every effort to engage the public now, so that no new Vanderbilt Yards deal is ratified without the public having a substantial opportunity to review and comment. Public engagement is always important, but it is particularly critical now that so many of the alleged public benefits of the Atlantic Yards project have diminished or vanished altogether. 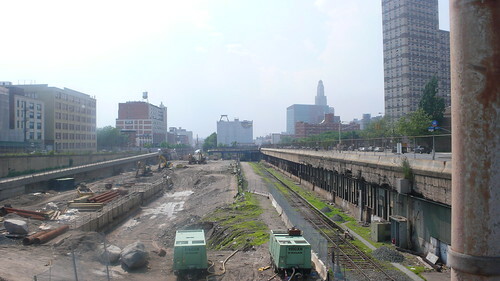 For example, the state of the art rail yard FCR was to build is no longer on the table as the new yard would have fewer tracks than are currently in place and that were originally promised; the IBO has concluded that the arena will now be a money-loser for the city; promised office space has been scrapped, substantially reducing revenue and jobs; there are no concrete or near-term plans to build the bulk of the promised affordable housing, which is contained in Phase 2 of the project plan, which has no timeline; the “world-class” Frank Gehry design has been scrapped for a cookie-cutter alternative; the much-touted “Urban Room” public space has been discarded; the remaining so-called public space is all contained in Phase 2, which again has no timeline; and then ESDC CEO Marissa Lago stated publicly that the project will take “decades” to complete, which will continue or even exacerbate for a generation the so-called blight the project was intended to resolve, and significantly delay or deny the public’s accrual of benefits. 1) Why is MTA renegotiating terms with FCR rather than demanding performance or rescinding the agreement and re-issuing the RFP in order to determine whether there are other interested parties? 2) In renegotiating the terms, did MTA consider that most of the alleged public benefits it considered in 2005 have since substantially diminished or vanished altogether? 3) Has the MTA contracted an independent appraiser to appraise the Vanderbilt Yards to determine their current Fair Market Value? If not, why not? What is the current Fair Market Value of the Vanderbilt Yards? 4) Given that the new agreement will be substantially and materially different from the original, making it a new agreement, does not the Public Authorities Accountability Act of 2005 now apply and impose a fiduciary duty on MTA board members and require that the sale of property for fair market value be supported by an independent appraisal? If not, why not? 5) What are FCR’s obligations to the MTA if the deal closes but the developer does not proceed with the project? Time is of the essence. These answers need to be known and made public prior to the MTA board considering any new deal regarding the Vanderbilt Yards. Therefore please provide a written response to my office no later than Friday June 19, 2009. Dennis Mullen, Acting CEO and President, Empire State Development Corp. 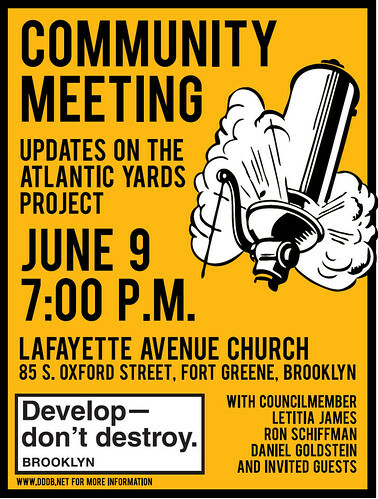 Following up on last week’s Atlantic Yards hearing, project opponents Develop, Don’t Destroy Brooklyn will hold a community meeting to provide updates on the plan: Tuesday June 9, 7pm at Lafayette Avenue Church, 85 S. Oxford Street in Fort Greene. Speakers will include Council Member Letitia James, Pratt Institute’s Ron Shiffman, Develop Don’t Destroy’s Daniel Goldstein, (all of whom are members of the Community-Based Planning Task Force) and others. On Friday, the State Senate Committee on Corporations, Authorities and Commissions (chaired by Sen. Bill Perkins) held a hearing on the Atlantic Yards project. The scene was hectic, with both pro- and anti-development factions representing in large numbers. Norman Oder has a thorough recap at Atlantic Yards Report. Do you have thoughts you would like to share about the proposed Atlantic Yards development? If you’re like us, you definitely do! Now you finally have a chance to weigh in on this proposed $4 billion Brooklyn mega-project. The Community-Based Planning Task Force will join City and State agencies, environmentalists, planners, and other community members and advocates to give testimony at a public hearing on Atlantic Yards on Friday, held by State Senators Bill Perkins and Velmanette Montgomery. Oral testimony on Friday is invite-only, but the public may submit testimony via email. 3) community-initiated alternative plans should be given more weight in the decision-making process. For some great background on the issues, check out Atlantic Yards Report’s extensive overview of questions that should arise at the hearing. When the Architect’s newspaper recently asked starchitect Frank Gehry about the mega-development, he responded, “I don’t think it’s going to happen.” This was followed immediately by much backpedaling and an insistence from developer Bruce Ratner that the project “will get built.” Doth he protest too much? Project opponents Develop, Don’t Destroy Brooklyn announced earlier this week that they have filed a motion to the Appellate Division seeking the right to appeal a Febuary 26 ruling against them in their legal case challenging the project’s environmental impact statement (EIS). At issue is whether the state had a “rational basis” for declaring the development site blighted. In the meantime, delays are costly for Ratner’s New Jersey Nets, who would play at the Atlantic Yards arena, and rumors are flying that Turner Construction is off the project. yet The Real Deal reports today that Ratner has purchased a property within the footprint, 467 Dean Street, his first such purchase in over two years. 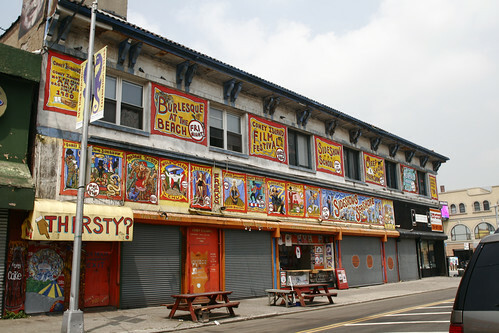 At this very moment the City Council is holding an oversight hearing on Coney Island development, which is sure to make tomorrow’s headlines. On the eve of this hearing, the NY Times reports, the City offered Coney landowner/developer Joel Sitt $105 million for approximately 10 acres, which the City hopes to develop according to its own plan. Will he accept? The Times article makes it seem unlikely. The Brooklyn Paper has a thorough wrap-up of yesterday’s opening arguments in Goldstein et. al. vs. Empire State Development Corporation, the case brought before the State Supreme Court by tenants who are threatened with displacement via eminent domain for the proposed Atlantic Yards development. A ruling on the case is expected in several months. 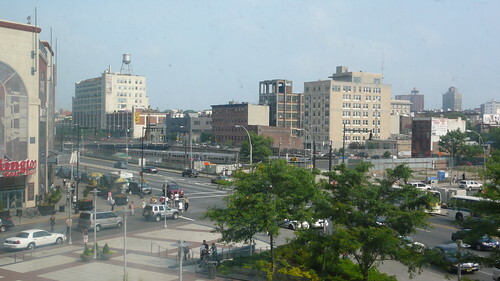 A diverse coalition of community groups, good government groups, political organizations, and local clergy sent a letter (PDF) to Governor David Paterson today, asking that he deny the floundering, $4 billion Atlantic Yards development financial assistance from the $24.6 billion in federal stimulus money that will soon come to the aid of New York State and City. Despite confusion about whether the project is even eligible to receive stimulus funds, there’s no question that developer Bruce Ratner has been lobbying for a handout. While the MTA has stated that AY is not on its priority list to receive funding, the Post reports that the project could still receive money directly though Governor Paterson. The development proposal already has the financial benefit of City, State and Federal subsidies estimated at around $1.5 – $2 billion. For those interested in sending their own letter to Gov. Paterson, his contact information is available here.